Dharini Modi - The Power-Lifter Lifiting The Tricolor High! Recently I came across a story, that said in India alone, only one in ten thousand women get a chance to pursue sports of their choice beyond the age of six! It hit me. And I raised a debate on SHEROES. I asked the members, how many of them have faced it. And given a chance how many would go back to sports, even if as a hobby? The debate got an overwhelming response, as most of them wanted to resume a sport of their choice, even if as a hobby. 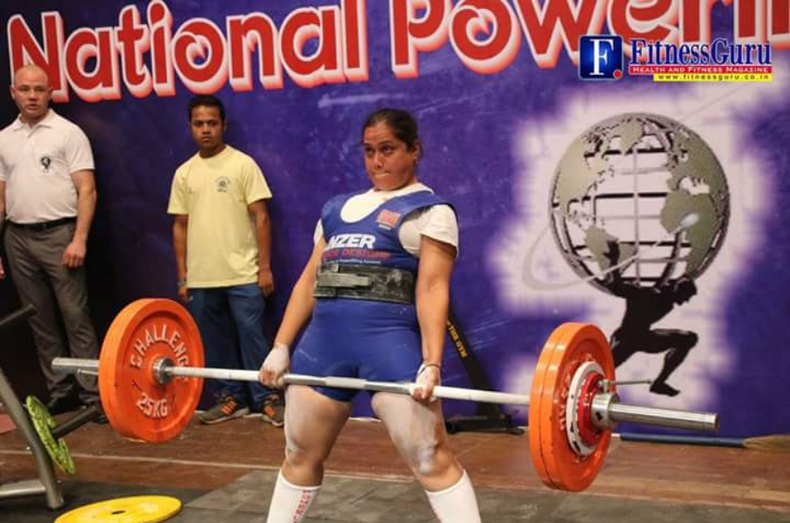 But one woman out of all who participated in the debate caught the fancy of my pen- Dharini Modi, who wrote that she is making India proud in weight-lifting! And I checked her profile. Take a look at what I found out. And I jumped at the opportunity of interacting with her. Daughter of a home manager mother and government employee father (who works at the Ahmedabad Municipal Transport Service) Dharini sent me a two-page long rundown of what she has achieved in life so far, as a sportswoman! I am just sharing just the major ones as below. National and West zone gold medallist, 2018, Durg. Federation cup bronze medallist, 2015, Punjab. National gold medallist in bench press 2016 Jamshedpur. IRPF national gold medallist 2017, Bangalore. WPU world Championship Gold medallist, Squat and Deadlift record holder 2017, New Delhi. WPC world championship Gold medallist and Squat record holder, 2018, USA. The above list is the tip of the iceberg! Besides, power-lifting and weightlifting, Dharini told me that she has played and excelled at school level in other sports as well. These include Kabaddi, Softball and Rope Struggle too! I am awestruck. So why weightlifting (it is labeled to be a men-ruled sport)? "As I grew older, I was attracted towards weightlifting and power-lifting. With rigorous training and hard work, I began excelling in State Level and then National Level. In the early days, the competition was tough, and we struggled to access the basic facilities. But as the saying goes - 'When the going gets tough, the tough get going.' My family support, hard work, patience and above all faith in God kept me going," responds an elated 31-year-old Dharini. Dharini did her Masters of Physical Education in the year 2015 and says that it helped her a lot in reaching where she is today. "Education is very important. Thankfully, my parents and two sisters have been very supportive of my career choices. My husband has done diploma in Bodybuilding and is a fitness trainer, and understands my passion-based work commitments," details the mother to a six-year-old girl. I felt as if a movie, with streaks of similarities to World Champion Boxer Mary Kom's achievements, was running in front of my eyes. But life has not been as easy as Dharini made it sound above. Slowly she starts opening up. She is not just a sportsperson, but also a fitness trainer. "Mahima, as a sportswoman in India, I do have a lot of challenges, hurdles, besides a very hectic schedule as a sportswoman who has a little girl to look after. The toughest part of life as a sportswoman is that I have been selected for a lot of National and International Games, but there has been no financial support from Government. There have been no scopes of sponsorship or scholarships which have always remained the biggest struggle for me. I have so far traveled on my own expense to meet the requirements of the state, nation or country," explains a very sad Dharini who says she wishes to raise the national flag at the Olympics but doesn't know how that will happen. My heart skips a beat. Despite all the hardships, when you ask her would she like her daughter to be a sportswoman, she says it will be her daughter’s decision. She says she won’t stop her. Why? "Well, my achievements can answer this question well. Moreover, I would always encourage a woman in sports, because just due to challenges or hurdles you cannot stop living! Women are more powerful than men as most of the female population today work as well as manage the household chores! Being independent is very important for every woman," asserts a very determined Dharini. So what does a typical day look like in Dharini's life? She reverts with the speed and focus of a bullet out of the gun, "I am dedicated to my sports life, so time has no bar, I give maximum time to it, juggling it between my daughter and various events. I have always given preference to my career. My husband plays a big role in my career without whose guidance I wouldn't have reached here. He has been my inspiration and great support throughout." Here I remind her that not even one percent of women get the support she has got from her family. What about their sports' dreams and career? A very composed Dharini responds, "I would tell them to listen to their instincts and have faith in their talent. And leave no stone unturned in an effort to convince their family. In India, the onus of a sports career doesn't lie on the woman alone. Parents, the family will stop you due to lack of facilities to excel. How many of us have funds to pursue a passion, let alone sports? So for young girls to bring Gold and Silver medals to India, I would like to request the government to encourage the women of our country by providing them with financial support. We would see a lot of money in other sports for men. But for women, there is no support. Give them the right facilities, finances, support and mark my words, they will give their 100% to bring fame to the nation." A lot of serious talks, she is obviously a bit sad, so I try to lighten the atmosphere by asking her who is Dharini at heart when she, not a power-lifter? She laughs, "Dharini Modi is a relaxed personality, tender and emotional by heart, her hobbies are traveling, eating good food, writing poetry, listing to music. Playing and spending quality time with her daughter, relaxes her. Off-late I have joined SHEROES and I am having fun out here, sharing my life stories as well as getting the love of so many. I was searching Google, for a website for women benefits and I came across SHEROES. I must say, I was quite impressed the way you people work for women benefits and upbringing. Keep up the good work!" And this attitude of her reflects in the umpteen posts she has done at SHEROES; not just to promote her passion and achievements, but also to inspire more and women through her umpteen conversations at this community-based women-only platform. “Mahima, my idea of joining SHEROES was not just to showcase what I am doing, but also to reach out to more women and inspire them to chase their passion...whatever it is. My idea is to reach out to more and more people because there is hardly any audience for women sports in India. You are a journalist and you know that already. And media too must come forward to promote women in sports,” asserts Dharini. So what’s her next goal in life. Dharini's answer leaves me perplexed and overwhelmed at the same time," I live in present Mahima. All I wish for future is do best for India; live happily with my family and give the best education to my daughter. As my daughter is my heart and soul." "NEVER QUIT! try to balance life, by setting priorities in life. Sports and my daughter both are my priorities. We mothers go to any extremes for our children's happiness. And in turn, we deserve the same, but for that, we have to have that respect for ourselves, our passion, our life. No one will respect you if you don't respect yourself. It is all in mind if the mind is strong and the determination is firm anything can be balanced and achieved." That was Dharini Modi talking to me in "#MeetTheSheroes Series" that I am conducting and penning exclusively for SHEROES. If Dharini's life has motivated you, do share her story with everyone you can...EVERYONE because every house has a girl, a woman, a mother who needs the motivation to respect herself to help achieve her dreams. And also don't forget to cheer Dharini by leaving love for her in the comments column. You can also Follow Dharini on SHEROES. See you with another big bang exclusive story soon!